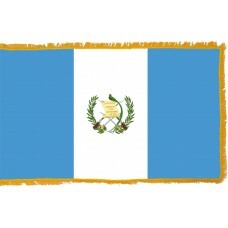 The Flag of Guatemala is also referred to as the "Azuliblanco" or "Pabellon Nacional." 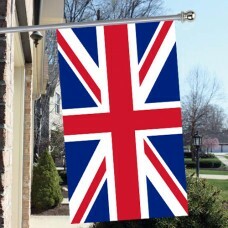 The former name in Spanish referring to the two colors on the flag of blue and white. 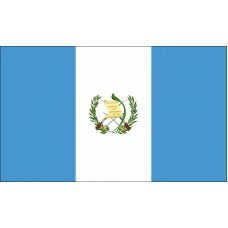 The flag has a white vertical band between two blue vertical bands signifying the geographical position of Guatemala between two seas - the Pacific and the Atlantic and the blue sky above. The white band stands for peace and purity.On the white band, in the center is the national coat of arms which dates back to 1871. This coat of arms consists of the national bird the Quetzal, in green which is holding a white scroll with an inscription of "Libertad de 15 de Septiembre 1821" which is when Guatemala left Spanish rule. On this emblem you will also find a green wreath of laurels, the symbol for victory, two crossed rifles to show the country will defend itself by force, and two crossed swords for honor. 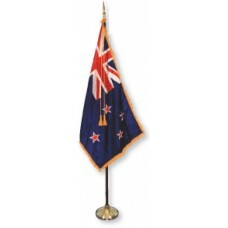 Many of the elements of the flag are referenced in the national anthem of the country. This Central American country has a rich array of geographical and historical sites to be seen including volcanoes, rain forests, Mayan ruins and Spanish colonial buildings. Guatemala was at the center of the ancient Mayan civilization and so many elements of this are still very much apparent to this day. Some of the most extensive Mayan ruins can be found at Tikal, a UNESCO World Heritage site where about 3,000 ruins dating from 600 BC to AD 900 can be found; also, the Museum of Archaeology and Ethnology in Guatemala City holds one of the largest collections of Mayan artefacts. It is not just the ancient Mayan sites and artefacts that remind us of the incredible history of this country, it is in everyday things like the food which is still very much based on that of the Mayans of corn, beans and chilies. A good percentage of the population is of the indigenous Maya people and over 20 Mayan languages are still spoken in the country even though Spanish is the official language, meaning many inhabitants are bi-lingual. The Spanish colonization left its mark also as seen in the architecture, the religion of Catholicism, the language, and names of people and places; but these are often combined with Mayan traditions and practices. You will notice the contrast between these two different cultures when travelling around the country. Those who are of the indigenous Maya people tend to be poorer and live in the rural highland areas, whereas the relatively wealthy European influenced population are found in the urban areas and are known as Ladinos, but this hasn't meant the erosion of the Mayan heritage, it still stays strong. In fact, on gaining their independence from Spain the Guatemalan people chose to go back to their Mayan roots having the Queztal, (the national bird) on the Guatemala flag and even naming their currency the Guatemalan Queztal in line with the fact that the Mayan's used to use the tail feathers of this bird as currency.